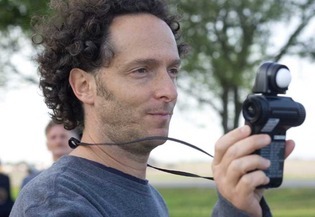 I was amused to see the picture accompanying one of the most recent in-depth interviews with Emmanuel Lubezki, a featured cinematographer in Chapter 4 of Moving Images (titled “Storytelling with Light”). 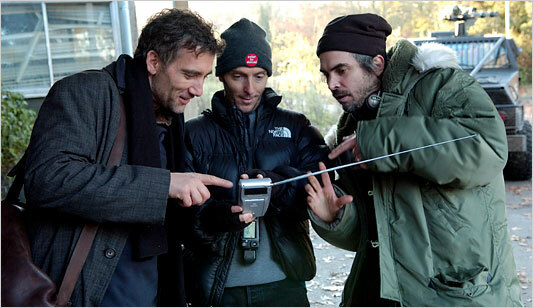 This photo from the shoot of Terrence Malick’s Tree of Life shows Lubezki measuring light. When I was in the process of completing the work for Chapter 4 of Moving Images, which focuses on cinematography and compels students to understand and reflect on the capture and use of light and its impact on visual storytelling, I found an image that showed a famous cinematographer using a light meter. I thought it would serve as a good illustration of a director of photography at work and bring home the basic idea that light is something that can be measured and manipulated in order to create the images that one wishes to use to tell a story in moving image media. I contacted him to request permission to use the image. He responded with a thoughtful response, but he forthrightly declined, making a variety of comments that amounted to “these devices are stuck resolutely in the past” and offering phrases of the “manufacturing a buggy whip after the invention of the car” variety. I moved on and was graciously offered an image gratis from independent filmmaker William Farley. The cinematography of Emmanuel Lubezki offers some of the most powerful contemporary examples of the expressive possibilities of moving images, particularly his work with Alfonso Cuarón, such as the awe-inspiring Children of Men and A Little Princess (see Fig 4-14, Moving Images); with Terrence Malick (including the Oscar-nominated The Tree of Life); and in Tim Burton’s Sleepy Hollow. And here is a commercial directed by Lubezki for broadcast during the recent London Olympics. For more thoughts on issues about working in digital or celluloid-based media, here is an interview with cinematographer Janusz Kaminski, Steven Spielberg’s long-time collaborator and DP on War Horse and many other features. In the accompanying article they announce that Kaminski would be shooting Harmony Korine’s Spring Breakers, but the cinematographer of Saving Private Ryan didn’t seem to have what it takes to make the cut since Benoît Debie ended up as DP. In 35. Go figure.